"Well, we're in deep, deep yogurt now — without a spoon," Trish said, smiling grimly. With tremendous effort, Brad stifled a laugh, because he had just sipped some coffee, and a laugh would have made a significant and painful mess. He swallowed, and then pleaded, "Not while I'm drinking coffee, OK? Seriously, what on earth are we going to do now? Even with this emergency I bet we can't get a conference room till Wednesday." "Main Reading Room." 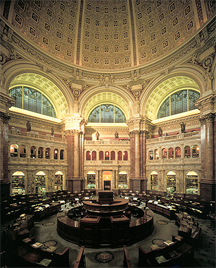 US Library of Congress. Baker, Reid, photographer. 1991. "No problem," said Trish, smiling. "We already have one." Trish had violated company policy by reserving a room without first scheduling a meeting. It was a little trick she had learned from having been down this road before. In whatever role you play, you have and use "personal trade secrets." For instance, if you travel by air to make a presentation, you might carry with you a backup copy of the presentation on a flash drive, in addition to the one on your laptop, in case your laptop dies. Or maybe you call ahead to a pal in Purchasing and ask for help in filling out a req, to make sure it goes through on greased rails. These personal trade secrets make you more effective. They help your teams perform at higher levels, and they make your company more competitive. Many of us feel that if we revealed our secret tricks, we might be less valuable to the company, because then we could be replaced more easily. Maybe, but think back. You'll probably find that your secret tricks have evolved over time. They tend to have a short shelf life. Some of us fear that if others knew our secret tricks, they might out-compete us for status or promotion. Perhaps, but your competitors will soon figure out secrets of their own, and some of those will be the same as yours. Your secret tricks might be invisible, but they aren't secrets for long. Sometimes our secret tricks conflict with company policy. Revealing them could be dangerous. This is truly tragic, because it prevents the company from understanding the true costs of those policies. What if somehow we could share our personal trade secrets without these risks? If you knew some of the personal trade secrets of your peers, chances are excellent that you would adopt some of them yourself, and everyone would benefit. Would you like to see your comments posted here? rbrenagcGyxpgikCJfuEHner@ChacGhVKZZqbgvFbgDfToCanyon.comSend me your comments by email, or by Web form. I offer email and telephone coaching at both corporate and individual rates. Contact Rick for details at rbrenKeANYTstQmKQaOEiner@ChacZrjddPpbxIKQWQtVoCanyon.com or (650) 787-6475, or toll-free in the continental US at (866) 378-5470.